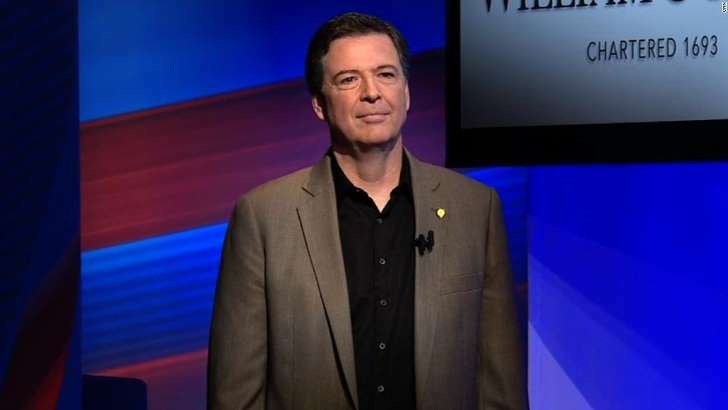 James Comey's CNN Town Hall appearance at William & Mary University Wednesday shed little new light on his tense, private discussions with the President. Nor did it elicit definitive, explosive sound bites to suggest Trump might be compromised by the Russians. But the deeper message of James Comey's whirlwind media tour came into clearer focus in his sit-down with Anderson Cooper, as the former FBI director hammered home why it's important to protect the Justice Department from increasingly sharp attacks by President Donald Trump. Trump has assailed his own Justice Department, the FBI, and the people who run them — even some of the leaders he has hired. "They view the institution of justice with contempt," Comey said of the administration, telling the crowd that top leaders view it as just another piece on the chessboard of power that can be knocked over when it's unneeded or in the way. "That is a terrible place for us to be as a country." Comey has emerged as a rare, clear-headed adult in a nation full of partisan voices looking to cast blame anywhere except their own Democratic or Republican doorsteps. That became clear when Comey was pressed several times by audience members and by Cooper on why he didn't give a blunt "no can do" refusal to Trump when the President ushered everyone out of the room and asked the FBI director to drop the investigation into Michael Flynn. "I get the feedback..." Comey finally responded on why he didn't bluntly cut off the man with the nuclear codes, while sitting alone with him in the room that embodies the President's awesome power. "But I don't know if that's fair." It's absolutely not fair. Not many people could stare a sitting President in the face — one with the power to fire you — and warn him not to cross a line of propriety by trying to influence a criminal investigation. The Hollywood response would be to shout, stomp and say "I don't have to deal with this," the way Trump might on "The Apprentice" or in the middle of a New York City real estate deal. That's the difference between Trump and Comey, a politician and prosecutor. The Justice Department's job isn't to win votes or ratings — or have a face-to-face argument with the commander in chief — but to uphold laws of the land rooted in what's fact. Comey decided, understandably, to get out of the awkward meeting with Trump and immediately record what happened in the Oval Office to preserve the facts for possible later legal action. It was a smart and brave thing to do. He admitted his own flaws, too, pointing out that any good leader makes mistakes, a confession of error we have never heard come out of Trump's mouth. And he mused on no-win situations where the DOJ had to weigh what was in the public's interest instead of personal or political considerations. The most striking part of Comey's performance was the way he conveyed the stakes of the current White House attacks on the Justice Department. At a time when facts are muddled, spun and cherry-picked to fit political strategies, the Justice Department stands as a crucial institution dedicated to showing the public the way things really are. Comey preached facts, explaining his actions in the Russia probe and the investigation of Hillary Clinton's emails with nuanced answers rooted in actual law that governs what can be done — not simply what the public wants. The truth, like Comey's answers, is often messy. The truth doesn't always fit into something packaged in an hour-long special or five-minute stump speech. There was a sobering moment near the end, as Comey rattled off Trump's criticism of the DOJ and FBI, and the President's suggestion that some of the people who led them — including himself — should be in jail. "Just pause for a second and reflect on that," he said. "That's not normal. That is an attack on our core values." All too true — which is why we need to keep a clear head, filter out the noise and leave partisanship out of the law.